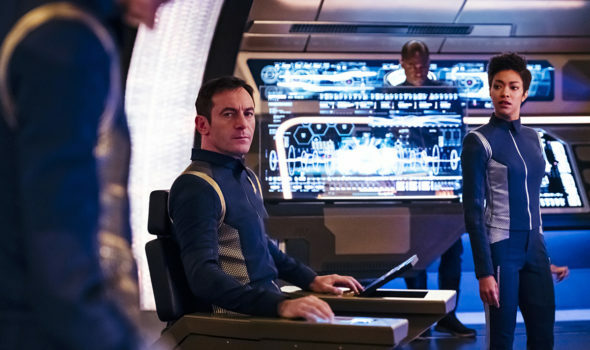 The crew of the USS Discovery will “boldly go” to a place cancelled TV series never see. CBS All Access has renewed its Star Trek: Discovery TV show for a second season. The renewal news comes about three weeks ahead of the show’s mid-season hiatus. After the November 12th episode, Star Trek: Discovery will take a break until January of the new year. A CBS All Access streaming series, Star Trek: Discovery stars Sonequa Martin-Green, Doug Jones, Jason Isaacs, Shazad Latif, Anthony Rapp, Michelle Yeoh, Mary Wiseman, Chris Obi, Mary Chieffo, James Frain, Rainn Wilson, Terry Serpico, Maulik Pancholy, Damon Runyan, Rekha Sharma, Kenneth Mitchell, Clare McConnell, and Sam Vartholomeos. A prequel to Star Trek: The Original Series, the sci-fi drama follows the crew of the USS Discovery, during the cold war between the Federation and the Klingons. The first six episodes of STAR TREK: DISCOVERY are currently available to stream on CBS All Access. All new episodes are available on demand weekly after 8:30 PM, ET on Sundays exclusively for CBS All Accesssubscribers in the U.S. As previously announced, STAR TREK: DISCOVERY will air in two chapters. The final episode of chapter one will debut on Sunday, Nov. 12, and the second chapter, featuring the remaining six episodes, will return in January 2018. What do you think? Have you been watching the Star Trek: Discovery TV series? Did you expect it to be cancelled or renewed for season two? Is it worth subscribing to CBS All Access, in order to check it out? Let us know, below. Already stopped watching this star trek knockoff. If you want a good series to watch check out the orville. More like ST than this POS. This is not Star Trek. It is horrible. They have officially red shirt Star Trek. So sad.